‘Kuppam’ meaning a ‘meeting place’ or ‘confluence’, is situated where the states of Tamil Nadu, Andhra Pradesh and Karnataka meet. Set at the vertex of three thriving regions, the citizens of Kuppam, have absorbed related cultures, customs and traditions and as a result, have evolved into an open minded, progressive community. Kuppam is a far-flung rural area like countless others in India. Driven by the progressive nature of its people, Kuppam seemed an appropriate location for HP’s i-community initiative, which seeks to make Information Technology flexible enough to benefit people all over the world; developing economies in particular. 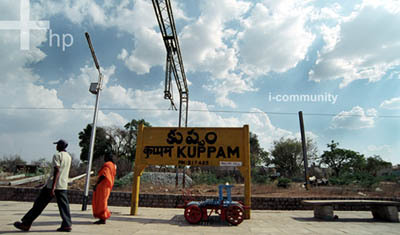 HP launched the world’s first i-community or inclusive-community at Kuppam in February 2002. Three years later, the citizens of Kuppam, around 300,000 in number, have access to Information & Communication Technology based solutions to everyday life situations - solutions that also have long ranging social and economic benefits, as well, thereby helping this rural region grow faster. The i-community program seeks to address these problems, and aims to build leadership and capabilities within the community, thus establishing a lasting model for sustained socio-economic growth. With its traditional technology and business model innovation leadership, HP partnered with the Government of Andhra Pradesh, local government bodies and specific domain experts to deliver on-the-ground solutions, tailored to local conditions. Comprehensive in-depth research, led to the creation of innovative ICT solutions in the domains of education, healthcare, government interface, socio-economic development and citizen empowerment. The task translated to creating new job & income opportunities, access to new markets, greater access to government programs & schemes, creating entrepreneurial leadership and capacity building models, with information technology providing the necessary framework.